Marjorie Mortensen, a 78-year-old vendor at the GreenFlea Market on the Upper West Side of Manhattan, offers much more than the jewelry she has displayed at her booth. 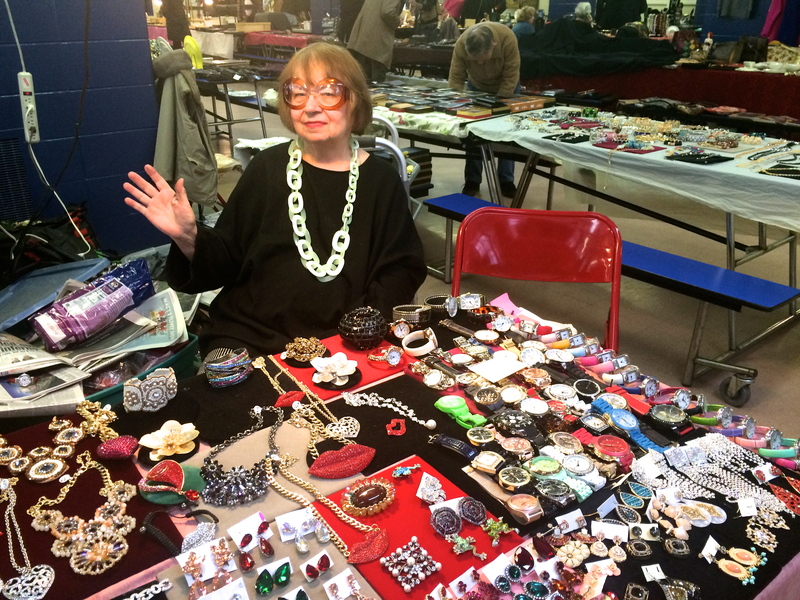 She’ll trade jokes, give restaurant recommendations, and tell stories about some of the fascinating people she’s met being a flea market vendor for 30 years, all while styling some of her costume jewelry and a fun pair of glasses. Lily: What do you specialize in selling here at the flea market? Marjorie: I sell all costume jewelry, which means no gold, no silver. I buy every piece myself; I don’t buy anything without having it in my hand. And I buy too much. I’m having a half price sale because I got carried away with buying. L: Do you have any favorite pieces you’re selling right now? L: Can you tell me a little bit about the community of flea market vendors? M: A lot of vendors like me are retirees trying to do something interesting and get out there and meet people and enjoy a day … Some people have said to me, because I’m disabled, they’ll say, “Oh you don’t go out enough, you have to get out and meet people.” Well I sit here on my bottom all day and I meet people from at least 10 or 15 countries a day and they come back, you know. Some people come back after two years or something. L: Do you have any advice for first time flea market goers? M: Don’t start the day with 100 dollar bills. Bring small bills, that way if you want something you don’t have to ask for a huge amount of change. And respect the vendor. There are articles of how to shop at a flea market, like in Women’s Magazines that say “don’t pay the price, offer half” you know, and then pretend you’re walking away. It’s stupid and people try that sometimes. L: You mentioned when I first introduced myself that you used to be a writer? M: I wrote for the mayor for 17 years. I put on events as an event planner and I wrote the Mayor’s proclamations. L: How did you transition into selling jewelry at flea markets after being a writer? M: I did this for a hobby. I was a founder of an organization and was putting on a lot of bazaars… I had to pay the bills for that, it was what I was doing in addition to my job…and I did street fairs to get money for the organization and then I liked it, I liked meeting people. L: What was the organization you founded? M: It’s called the Tibet Center. We started it in the early 70’s when hardly anyone had heard of Tibet. And it’s still going in a different format today. At that time, Tibet was closed and nobody could come in or out. The papers wouldn’t write about Tibet because that was controversial to them and so I would do a bazaar and I’d write a whole press release about the bazaar, that we’re selling things and selling Tibetan food and then at the end I would put, “there are only 22 Tibetans in New York because the country is closed” and then they would put it in the paper. I did a dinner one time, cooking Tibetan food and a lot of restaurant and food people came. James Beard came. M: I’ve met people from every country except some of the countries in Africa… One of my customers turned out to be one of the leaders of the civil rights movement and I didn’t even know until he died and it was in the paper. And we used to see Andy Warhol almost every Sunday… You know there’s a lot of people that you know what their name is, but you don’t know what they look like. In New York, you never know who that somebody is. New York is small. 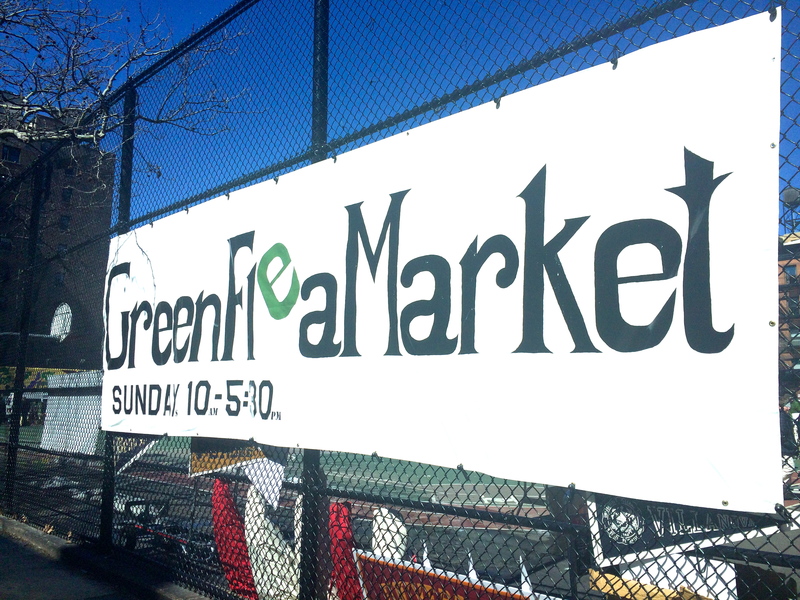 Go see Marjorie at the GreenFlea Market at 100 W. 77th St. Open every Sunday from 10 a.m. to 5:30 p.m.